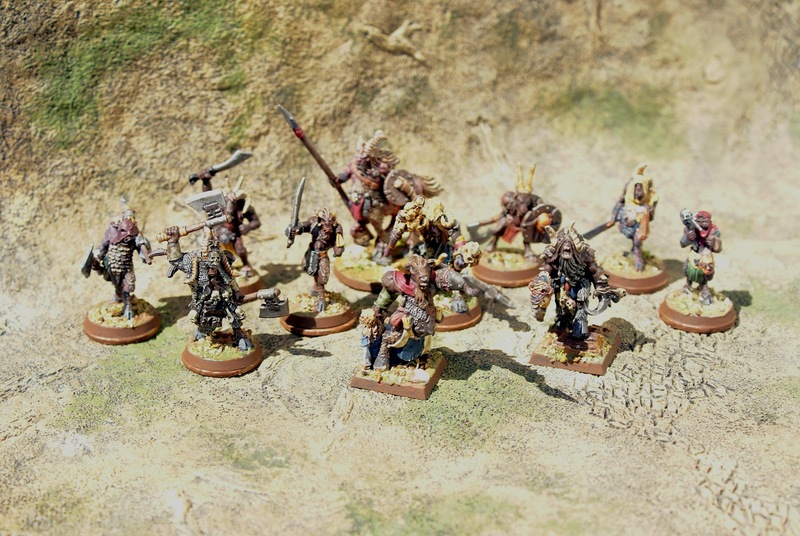 My third Mordheim Warband was created with the Mordheim Beastman Box set and a few additional metals I had. The box set produced for Mordheim by GW has some very beautiful models, with lots of detail and character. The band is led by Aroogah! who comes equipped with his own maid. He let her keep her unloaded blackpowder pistol to remind her of the futility of trying to defeat the Beastmen. Of course a shaman is a must have to counter the magical prowess of other warbands. Two Bestigors keep the rabble in line and guard Aroogah. A Centigor provides scouting and of course the desire to always be intoxicated. Rounding out the remainder of the warband are a mix of Gors and Ungors. The two below I believe are older GW metals. These four booty laden beastmen are all part of the Mordheim Beastman Warband box. The warband can also include Chaos Hounds. I know I have those models somewhere, its just a matter of finding them. Lastly this warband can field a Minotaur who is currently sitting on the paint table. The Thing in the Woods, a Mordhiem Abomination! If my memory serves, this model required a fair bit of pinning & greenstuff. The model is quite hefty. My second Mordheim Warband is a Skaven one. I can see just from the numbers of completed figures that this warband has some work cut out for it. It appears I only have the Heroes completed. Led by the Assassin Adept, Sniven, this ragtag mob shows no mercy to those who hope to harbour their much desired Warpstone. Armed with his Fighting Claws, he is a source to be reckoned with. He is of course assisted by a Sorcerer of the Horned Rat. Sniven's bodyguards are two Black Skaven, Kung and Pao who ensure the followers stay in line. The last two heroes of the warband are Nightrunners, who although lacking in the knowledge of the others are quick learners should they survive the battle. As noted above, there are no henchmen currently completed. And of course no Skaven Warband would be without the dreaded Rat Ogre. I've completed 2 more stands of Goblins and another stand of Trolls for my Goblin HOTT/Impetus force. Up first is my second Troll/Behemoth Element. This one contains two of my long time favorite metal troll poses from Ral Partha. I've had these two for many years, with a horrendous previous paint-job that just had to go. So now they are refurbished and ready for the upcoming campaign. Next is the last of my Goblin Spear elements. They are a mix of GW metal/plastics and I believe an old Ral Partha figure. Last is the first of my Goblin Blade elements. There will be a total of 6 of these to round out the 12 elements of Goblins for the Impetus Army. Again these are a mix of metal Ral Partha, GW & plastic GW. Bruce once again brought out his game of Maurice, this time set in India pitting a Raj and some lackeys against the East Wind Trading Company. I guess the East Wind company was rubbing the natives against the grain again. Mark played the British while Scott, Chris & I played the factions of the Raj. Bruce hosted and ensured we spent cards, received cards etc. Below is a shot of my force, looks pretty impressive for a bunch of Conscripts. I had 3 units of Cav, 4 Pike Armed Foot and a unit of Elephants. Apart from a single swivel gun on the elephants I had no shooting ability. We see the thin red line in the distance & begin to move up. Looking good thus far. The British sensing what will occur retrograde to prevent getting flanked. My Cavalry swarmed the end unit of the British, little knowing they were elite and were destroyed. Victoria Crosses began to be won. Below we see my next attempt. Again the Indians smashed into the British unit and were repulsed again & again as Mark continued to roll his 6's. Shortly after failing to break any British elements my force left the field realizing that sticks against muskets wasn't overly wise. Things on the other flank were not much better as the Mounted British Forces destroyed Scott's Mounted. The British Forces that made it into the town were nigh impossible to beat. Again Mark's dice rolling won the battle for him. I think we need to get him average dice to use while we continue with normal ones. Another fun game and the second chance I've had to play Maurice. The card system is very cool and it will take a few more games to get the whole strategy of passing on a turn to recoup cards and such. As well it was nice to see Bruce bring out some figures I didn't even know he had. The Indian forces have many interesting lookin units, with the Elephants, Ox Cart Cannons, etc. Thanks for hosting Bruce! Mark has been at me to run a game of Morheim with him. Its something he has been wanting to do for quite some time. As I have been going thru boxes getting stuff set aside for an upcoming Bitz Swap, I found the box containing a bunch of my Morheim figures. Although already painted, they had some nicks in the paint & so after touching them up, I used the Strong Army Painter dip to coat them & them Army Painter Matte Spray to complete them. My plan is to have a Mordheim venue at my 2nd Annual Rememberance Day Afternoon. Up first is my completed Witch Hunter Warband figures. There are a few more additions I still need to find/paint to complete it. Those whom I have gamed with in the past will remember these badboys. Led by Hans Velsing, whose hatred of Magic in renowned, they scour the ruins of Mordheim in the search for the blasphemers and twisted creatures of Chaos. Pan Demonium, (treated as a mace) which he wields with vigor to smite the unrepentant. Hans has also drawn 3 lesser known but no less determined Witch Hunters with him. Below we have Pil Grim, and the brothers Hiero Phant and Psycho Phant. These are Confrontation figures which are fanastic in their detail! And of course the ferocious Warhounds to tear opponents to shreds. Should one of the zealots prove his zeal, he has a chance to become a hero himself. I will be posting images of my other warbands as I find the figures. Needless to say I am getting a tad excited to play some Mordheim again, as its been a couple years since I've done so. As I slog along with painting my goblins for HOTT, I've decided it was also time to start on some of the peripheral items needed by the HOTT army. Namely a "Barker Marker" and a Stronghold. Up first is my Airship. During one of the town-wide garage sales I've attended in the past year, I found someone selling a bunch of Lego, which included some ships. After filing off all the nubs, I used cardstock planks for the deck. The four centre "guy-lines" are paper wrapped wire from the dollar store. They support the balloon ball. The remainder of the wires is string washed with brown ink. Needless to say there was a lot of glue used to keep it all in place. Even with using a sponge ball, the model was going to be top-heavy. So I had to use some real stones on the base to counter-balance it. The one issue that is currently bothering me as to its effectiveness in HOTT is that the base is deep - seriously deep at 18cm. One thing I always try to avoid is having bits extend beyond the base, as this has often caused issues with units being in frontal contact as well as breakage of the extending bits. I do have some goblin crew selected and they are sitting on the paint bench. The piece I used for the firepot is also I believe a piece of Lego, some sort of helmet. The ballast bags I made from greenstuff. Next up was another Goblin Spear element. I have 1 more Spear Element to complete before I move onto the Blades. They are currently drying from the Army Painter Dip. I have also completed my Stronghold for the Goblins. With the cornerstone being the GW plastic Shrine/Altar/Tent, the remainder was made from styrofoam boulders and a fence made from Sprue and Stir sticks. As units don't occupy Strongholds in HOTT, I have left space for a 6cm x 6cm stand just in case I use this camp for other game systems. Here is a shot of the Spear Element in the camp. at the club. His son Ian was up visiting from Calgary so joined us. As most know who have played this game, its a card based system where the player must decide whether to use the card for command range or as the event/ability listed. Mark has more about this evenings game on his blog. We had a fictional battle with 4 players. Ian (British) and I (Prussians), sallyed forth against Bruce (Austrians) and Mark '6' Wall (French). The objective was a small herd of Lamb. I guess the General's were due for a Ball or some such. We placed the objective on the enemies extreme right in a woods near Mark. We decided to mass our mounted forces in the centre, with my foot and artillery holding the flank hinged on a small town. Perfect for one of my two conscripts to hide in. I guess I did sort of forget that we were attacking, but then Bruce started to swing his irregulars thru the woods and towards my waiting cannons. I think my favorite card of the night was "This wasn't on the map!" where I got to place a marsh or rough area, which I landed right in front of Bruces mounted troops. As it turned out, much of the mounted sat out the entire battle. Most of the fight was at the far end of the table where Ian and Mark battled it out. I used the majority of my cards to assist my ally, lending him abilities to sustain or maximize his clout. It was a definate slugfest. We used the white dice to denote disruptions on units. Meanwhile Bruce continues the advance into the cannonfire. Eventually he was able to ride some mounted into the lead forces of my foot, catching one of the grenadiers (elites) in a flank, but with the right card at the right time I was able to fend off his attacks. I finally had a card with the command range needed to swing my troops to avoid the flank attack. By this time I was down to 2 cards in my hand having used most to support my ally. The mechanics for card renewal were interesting and I can see how the players must use the PASS option to rebuild his deck or face potential disaster. As the night was drawing to a close, here is the last view of the battle of the lambs on the far left of our forces. Ian's troops were pretty much finished off, though we still had a mass of mounted (which never moved), his guns and some foot in reserve. It was a nice intro to an era of gaming which I generally do not play, & I expect Bruce will be bringing this system to the club in the future as the rules system is fairly easy and fast. All the elements that a club game needs.